August 24, 2003: When I tested my son with an ACT practice test, I noticed that he had trouble detecting faulty parallelism in sentences. That meant he needed to review parallel structures. The Beatitudes are an example of parallelism in a group of sentences. Below is something that your child has probably studied although it was not called parallelism; it was referred to as "Keeping the same tense throughout the sentence/paragraph." (shifting tense). She had made pudding for breakfast and has made ice cream for lunch. Wrong, had made and has made are of different tense. by Edwin C. Wooley, PH.D. & Franklin W. Scott, PH.D.
115. 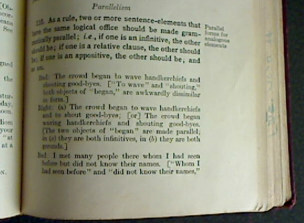 As a rule, two or more sentence-elements that have the same logical office should be made grammatically parallel; i.e., if one is an infinitive, the other should be; if one is a relative clause, the other should be; if one is an appositive, the other should be; and so on. Bad: The crowd began to wave handkerchiefs and shouting good-byes. Right: (a) The crowd began to wave handkerchiefs and to shout good-byes. (b) The crowd began waving handkerchiefs and shouting good-byes. Bad: I met many people there whom I had seen before but did not know their names. Right: I met many people there whom I had seen before but whose names I did not know. Bad: I delight in a good novel—one which portrays strong characters and in reading the book you are thrilled. Right: I delight in a good novel—one which portrays strong characters and which thrills the reader. Bad: Two courses are open to us: first, to have the missionary society transfer to us a missionary now in the field; second, one of our own members has volunteered to go, and we may send him. Right: Two courses are open to us: first, to have the missionary society transfer to us a missionary now in the field; second, to send one of our own members, who has volunteered to go. Two courses are open to us. First, we may have the missionary society transfer to us a missionary now in the field; second, we may send one of our members, who has volunteered to go. Bad: I have lived in many states, some for only a short time, while in others I have lived a year or more. Right: I have lived in many states,—in some for only a short time, in others for a year or more. Bad: I was asked to contribute to the church, Christian Association, and to the athletic fund. Right: I was asked to contribute to the church, to the Christian Association, and to the athletic fund. I was asked to contribute to the church, the Christian Association, and the athletic fund. The web page that is linked above defines parallelism and has examples as well as quizzes.